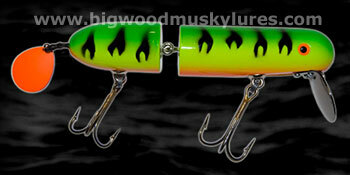 Description: The Water Chopper tailbait, by Lee Lures, is without a doubt, the loudest on the market. 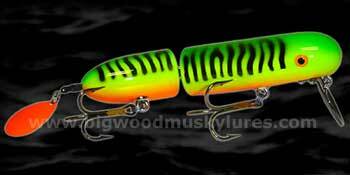 Designed by, Lake Mille Lacs and Madison Chain Muskie Guide, Lee Tauchen, this 6" pop-pop bait is one mean, tuned topwater machine. The .035" stainless steel tuneable tail blade, which is held in by two screws, is cupped severely to produce the most unique sound you have ever heard from a tailbait. 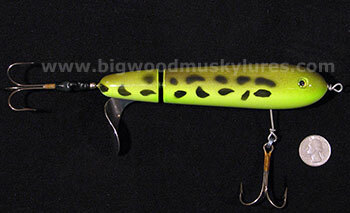 Lee Lures are real wood musky lures. Through-wire construction using .063" diameter shaft makes it durable enough to handle literally dozens of fish, maybe more! A brass tube is inserted and epoxyed into the tail section to provide a smoother surface for it to revolve around, where other makers use time saving rivets in either end. Also, the Eagle Claw 4/0 774 treble hangs from the custom hook-hanger, this “drop wire" provides for better hooking percentage and acts as a keel and keeps the bait upright, even in big waves. 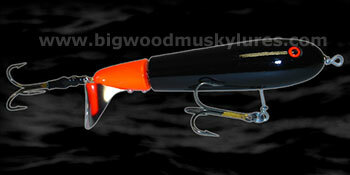 Finally, the 4/0 rear hook is heat shrunk for better hooking, and to eliminate fouling on the tail blade. 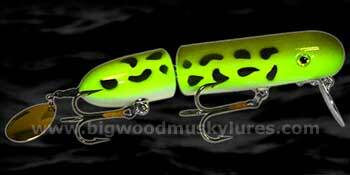 Light and color popping epoxy clear coat and 3-D molded eyes wraps up Lee Lures top shelf surface bait appeal. So if you are looking for the highest performing tailbait made, you have found it! 6", 2.1oz. 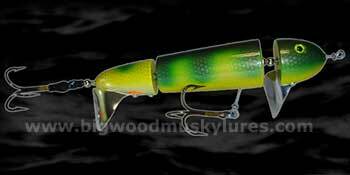 Lee Lures custom 2010, Water Chopper show colors available in limited quantities! Description: Big, mean and loud! 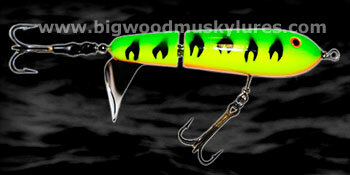 The Lee Lures Chopper HD is all of these things and more in a genuine wood, through-wire construction Musky lure. With the same, natural and distinctive "pop" as the Lee Lures Water Chopper, the Chopper HD is bigger in body length than it's cousin and is at home in 4 foot waves! The custom "drop wire" hook-hanger provides for better hooking percentage and acts as a keel to keep the bait upright in rough waters. 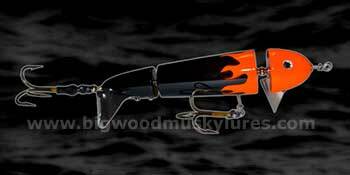 The rear hook is heat shrunk to stick straight back for better hooking percentages and to eliminate fouling on the tail blade. Unique colors are finished with an epoxy clear coat and 3-D molded eyes. 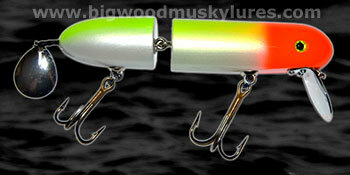 Lee Lures truly produces some of the best, high-end surface baits in Muskie fishing today. 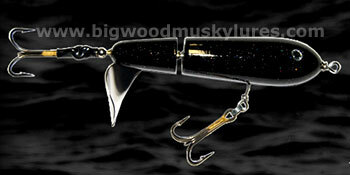 Big Wood Musky Lures is the exclusive online retailer of the Lee Lures, Chopper HD! 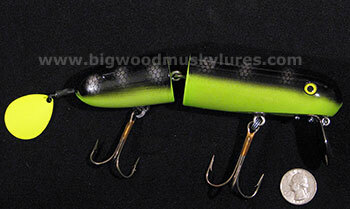 Description: The Lee Lures, Tidal Wave is exclusively available online at Big Wood Musky Lures! 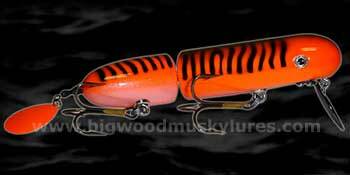 This custom, Muskie lure is a wooden, double-ended prop style topwater muskie bait that gets serious attention from any Muskie in the area that this lure is thrown. 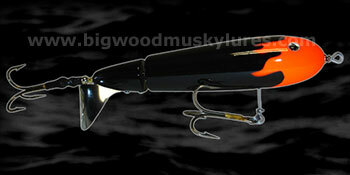 If you thought the original Lee Lures Water Chopper was loud, the Tidal Wave is like throwing two of those on one cast! Like all Lee Lures, the Tidal Wave is built to last with .063 gauge, through-wire construction and the same heavy gauge wire for the signature "drop wire" hook hanger. The .035" blades on the counter rotating head and tail of this noisy topwater musky lure are almost impossible to come out of tune. This Muskie bait comes with Eagle Claw 5/0 774 hooks on front and back with heat shrink on the back to eliminate fowling and increase hook ups. Wolverine triple ring, split rings and 3-D molded eyes. 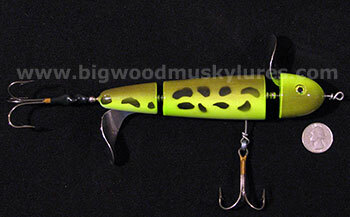 This musky bait has been responsible for some real giants! 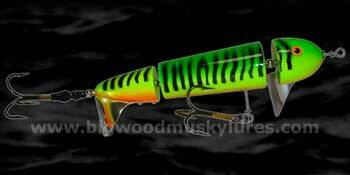 Description: This is the bait that started it all for Lee Lures. Designed by, Lake Mille Lacs and Madison Chain Muskie Guide, Lee Tauchen, this 6 3/4" crawling style surface bait has been responsible for many fish over 50" and even up to 55"! Lee Lures are real wood musky lures. The Top H2O’s natural swimming action comes from the flush cut joint and the .040" front lip giving it a snake like look in the water. In addition to the rear of the bait, is a swivel mounted size 5 Colorado blade, which makes contact with the rear hook giving it a unique sound. All stainless steel screw eyes are 1 ½" in length that help insure durability. Hung from them is Eagle Claw 774 5/0 front, and 4/0 in the rear on Wolverine “Triple Rings”. 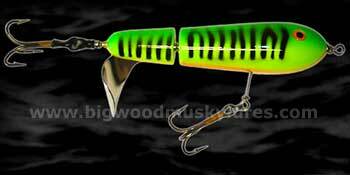 Light epoxy clear coat and 3-D molded eyes like all Lee Lures gives it that custom touch. Number one topwater lure choice for night fishing, cold fronts, and in heavy weeds. The Top H2O will become your go to bait for last light of the day. 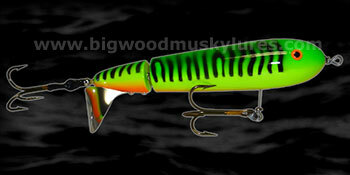 Lee Lures custom 2010, Top H2O show colors available in limited quantities!